Today, we have such a fixed image of the District and the Federal buildings that it’s easy to forget that our Nation’s Capital has been a work in progress for much of this country’s relatively short history. The Capitol has gone through several extensive additions and renovations since the completion of the north wing in 1800. The columns were added to the building as part of an addition which was completed in 1828. This work gave the building a new center section with a 24-columned portico, rotunda, and dome. With newly arriving States in the mid-1800s, the Capitol became too small to accommodate Congress. They undertook another expansion, which gave everyone more space but threw the dome out of proportion with the rest of the building. The tiny dome didn’t look right on one of America’s premier buildings, so it had to go. A new dome – the one we’re familiar with today – was designed and constructed. It was finished after the Civil War in 1866. The new dome fixed one problem but created another. If you’ve seen the Capitol in person, you know that the dome is visually overpowering. When you’re driving down a street facing the Capitol, it dominates the horizon. The new dome was so big that it threw off the proportions of the columns. It looked like the columns weren’t big enough to support the weight of the mighty dome, which, I imagine, was little off-putting for visitors. They corrected the issue in two stages. In 1904, there was reconstruction on the East Front of the building. And then later, in 1958, they extended the East Portico and removed the original columns. That could have been the last we ever saw of the columns. They could have been boxed up and put into a vast government warehouse à la Indiana Jones. For a while, that’s kind of what happened to them. 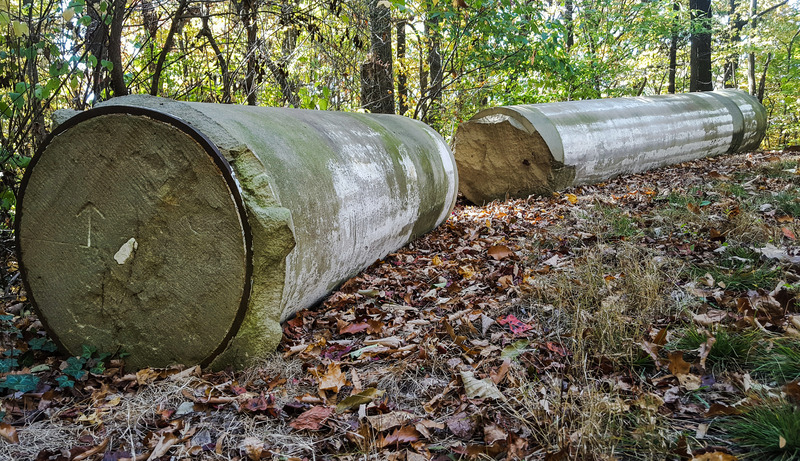 After being removed, the columns ended up in storage somewhere on the banks of the Anacostia River. History could have forgotten about the columns. Thanks to the hard work of the Friends of the National Arboretum, that didn’t happen. Ethel Garrett, a local philanthropist, led the effort to move the columns to their current location. She fundraised and lobbied, and her hard work eventually paid off. 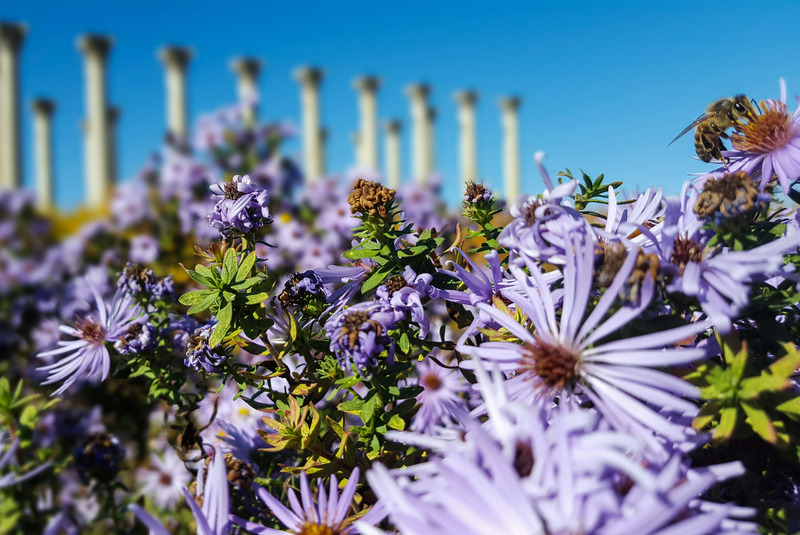 For over 100 years, these columns served as the backdrop for some of our country’s most famous moments, witnessing inaugurations, historic presidential speeches, and demonstrations. And now, surrounded by a reflecting pool and 20 acres of open meadow in the beautifully landscaped National Arboretum, they’ve found a fitting memorial. If you were reading carefully, you might have caught what looked like an error. There are 22 columns in the middle of the field. However, as I wrote at the beginning of this piece, there were originally 24 columns on the Capitol’s East Portico. Where did the other two columns go? They’re also hidden away in the Arboretum. 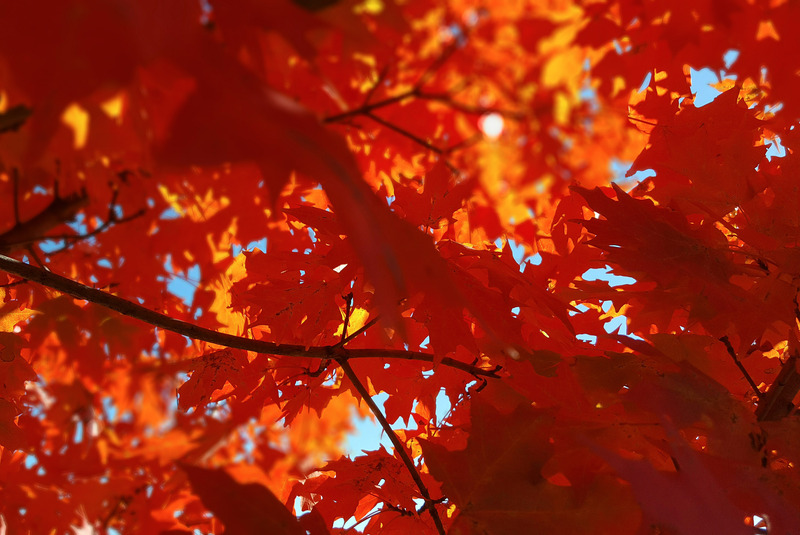 The National Arboretum, established in 1927, is 446 acres of unique trees, plants, and other horticultural wonders. It’s one of DC’s treasures. Unfortunately, it’s located on the outskirts of town, and most DC residents tend to forget it exists. There are nine miles of roadways winding through the Arboretum as well as trails. My favorite local hiking book, 60 Hikes within 60 Miles: Washington, DC outlines an awesome 7.3 mile-loop incorporating the trails and roadways. We used this map as a guide for our journey. To reach the missing columns, we needed to get to the top of Mount Hamilton, which is accessible via a trail that leads through the Azalea Collection. 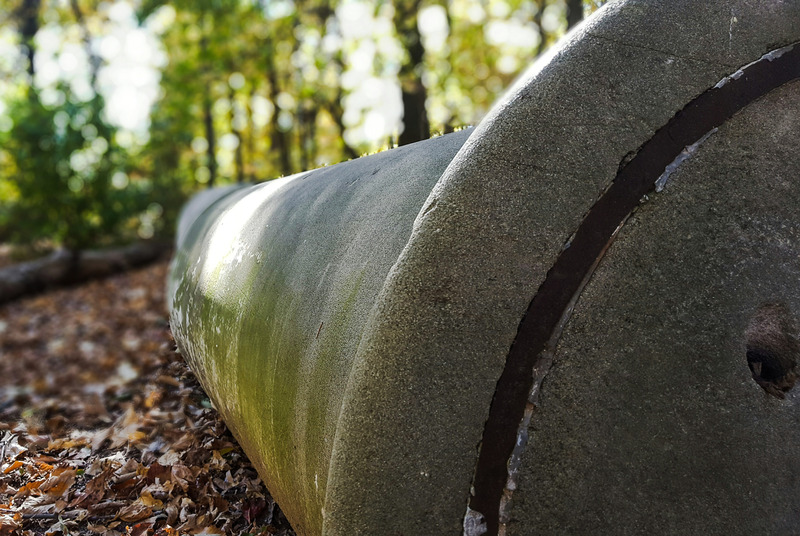 According to the book, at the end of this trail, we would find the two missing columns lying broken in a small clearing. I tried to find an answer through online research. But everything, including my hiking book, mentions the broken columns as an unusual curiosity without any details on what caused their current condition. I imagine that the years in haphazard storage weren’t kind to them. Maybe it was during that time that these two columns became damaged. The Azalea Trail wasn’t as well marked as I would have liked. I felt like we were walking blind as we made our way to where we thought we’d find the trailhead. Luckily, all of the trails were marked on my onX Roam app, so with the aid of my GPS, I was able to keep us on course to the top of Mount Hamilton. I’m going to go on a limb and say that Mount Hamilton is more of a big hill than a mountain. According to my topo map, it’s only 230 feet above sea level, and its gentle upward slope made for an easy hike to the top. 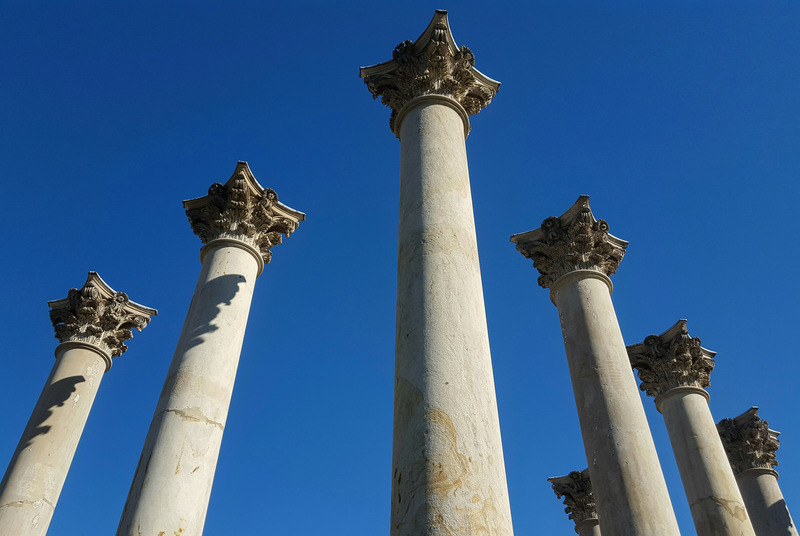 It’s one thing to read about the mysterious, broken columns; it’s another thing to see them. They’re just so…odd. The two columns are both cleanly broken in half. Their bases and capitals (the ornate piece at the top of the columns) are missing. They rest adjacent to each other in a very purposeful arrangement. After taking a lot of pictures, we walked along the road toward the Asian Collection, with brief detours at the National Grove of State Trees and Fern Valley. I was drawn to the Asian collection because there was a pagoda indicated on the map. I had no idea what the pagoda looked like, but I figured anything highlighted on the map must be cool. The landscaping in the Asia collection was unique with a nice mix from across the continent, but, I’ll be honest, the plants, not the pagoda, were the highlight of this part of the Arboretum. We had one more must-see thing before we packed it up and grabbed some lunch: The National Bonsai and Penjing Museum, which is located near the Visitor Center. It’s a truly beautiful collection of trees. As someone with an unfortunate reputation for killing every plant I’ve ever tried to cultivate, I find the effort and skill put into maintaining bonsai and penjing mindboggling. The museum opened in 1976 with a donation from the Nippon Bonsai Association to the U.S. to commemorate our Bicentennial. From there, the collections grew to about 150 plants. 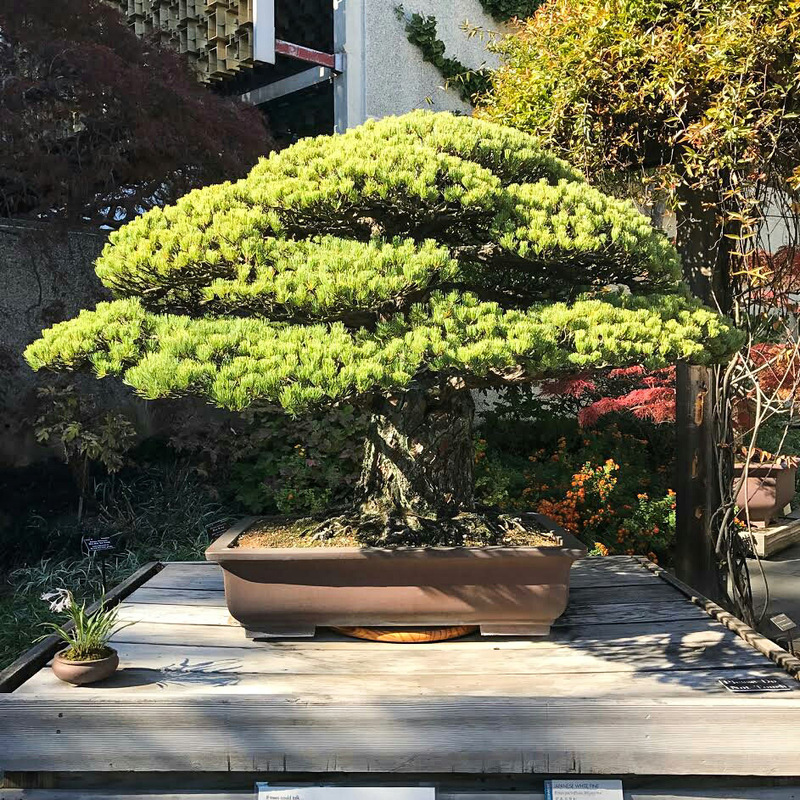 The star of the museum is a Japanese White Pine donated by the late bonsai master Masaru Yamaki which has been in training since 1625. Just think – this tree was over 150 years old when the United States declared its independence. On August 6, 1945, the Yamaki family and their treasured collection of bonsai were residing at the family compound in Hiroshima when the U.S. dropped the first of two nuclear bombs on Japan. The family and their trees all survived the blast. The fact that one of these trees would eventually come to DC as part of a gift of friendship between the United States and Japan is pretty remarkable. This ancient tree, which has long outlived its life expectancy, is a powerful symbol of reconciliation from one family that was deeply affected by the bombing of Hiroshima. When you look at this small, well-cared for, ancient tree, which has seen more years than any of us can possibly imagine, it’s hard not to feel a little awe. Adventure done, we decided to warm up with some hot chocolate at this new place in Shaw, The Royal. I don’t want to oversell it, but this hot chocolate was basically the best. 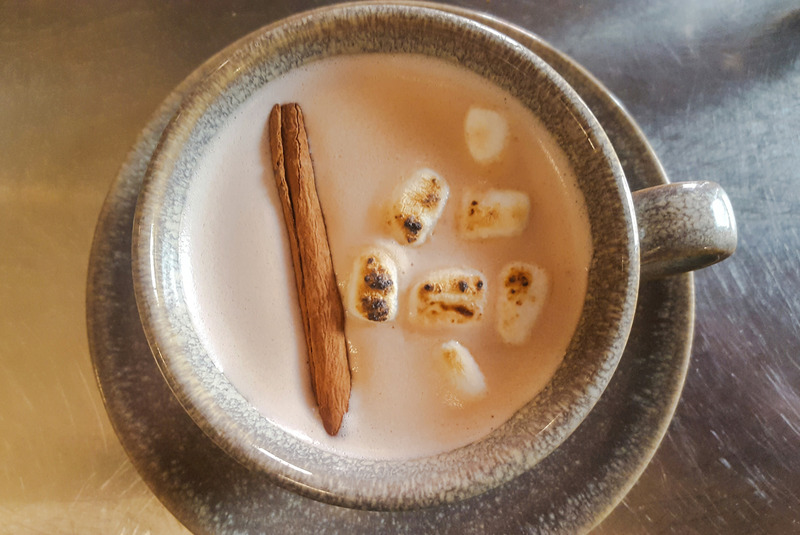 It was nicely spiced with roasted marshmallows – the perfect way to cap off a fall outing. 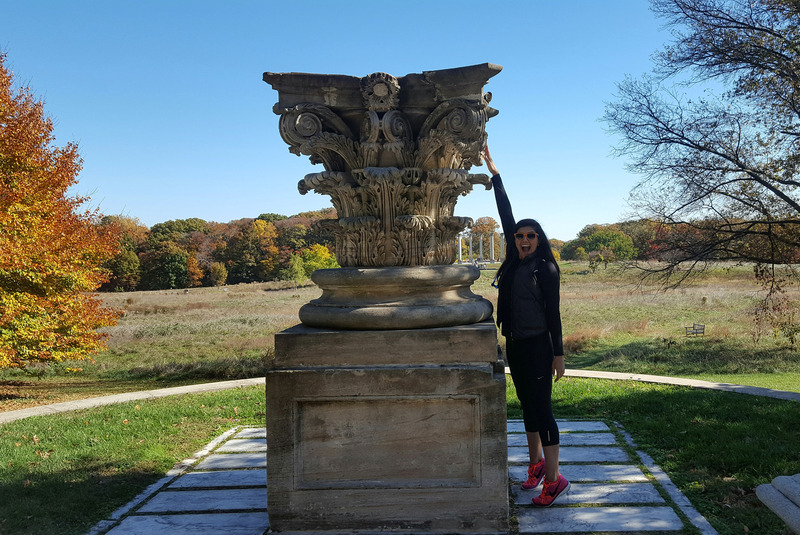 It’s a definite must-see stop, and all the paved roads make it very bike friendly. Thank you! I’m glad you enjoyed it and I hope you’re able to come see it for yourself!